Army Sergeant Jorge Gutierrez enlisted in the US Army immediately following the terrorist attacks on September 11, 2001, and reported for basic training shortly thereafter. Sergeant Gutierrez deployed to Iraq with the 1st Battalion, 14th Infantry Regiment. Upon arrival in Iraq, Gutierrez found that the unit’s role would be a very dangerous one; they were selected as being Quick Reaction Force, a crisis response force for developing situations. During his first couple of months in Iraq, Sergeant. Gutierrez was engaged in multiple firefights and encountered many improvised explosive devices. On the morning of February 14, 2004, while conducting raids on suspected insurgents, Sergeant. Gutierrez was in the back of the cargo Humvee yelling at the driver to drive faster to get out of the kill zone, when the driver suddenly lost control of the Humvee. Sergeant Gutierrez was ejected from the back of the Humvee. He was knocked unconscious, suffering a traumatic brain injury and injuring his back. He was sent to Baghdad to see a neurosurgeon, where a decision was made to medevac him to Landstuhl, Germany to be stabilized. Sergeant. Gutierrez suffered from hemiparesis for a couple of days. Four months after the injury, Sergeant Gutierrez was given the OK to return to Iraq to finish his deployment with his unit and his men. On September 4, 2004, Sergeant Gutierrez and his unit were conducting a foot patrol in a small Iraqi town named Huwijah when a sniper killed one of his closest friends. Later on in the year, a suicide bomber dressed as an Iraqi soldier walked into the dining facility and detonated himself. The blast killed 14 U.S. soldiers, four U.S. civilians, and four Iraqi soldiers, and wounded nearly 100 others. Just a week later, Sergeant Gutierrez was walking back from eating dinner when an enemy rocket was fired from outside the base, landing about 50 feet from him. He was knocked unconscious again. The IEDs, firefights and deaths that Sgt. Gutierrez witnessed left him with serious post traumatic stress disorder and post-concussive symptoms. The years of war in Afghanistan and Iraq have brought PTSD among military personnel to the attention of the American people as never before. Blast waves from explosions rattle the brain and can cause traumatic brain injuries which are often linked to PTSD. Most PTSD sufferers repeatedly relive the trauma in their thoughts during the day and in nightmares when they sleep. While the condition varies from person to person, more and more studies have linked PTSD with chronic depression and suicidal ideation. For his service to his country. 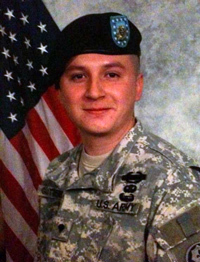 Segeant Gutierrez was awarded the Iraq Campaign Medal with Two Campaign Stars, Combat Infantry Badge, Expert Infantry Badge, Army Achievement Medal, Army Commendation Medal, Global War on Terrorism Service Medal, National Defense Service Medal, Overseas Service Ribbon (3x), Parachutist Badge, Air Assault Badge, and the Army Good Conduct Medal (2x). Building Homes for Heroes gifted Sergeant Gutierrez, his wife Amina, and their three sons a home in Hobe Sound, Florida shortly before Christmas Day in 2014.